The Department of Computer Science offers both Information Technology (IT) and software degrees. In Information Technology, we offer one full-time level 8 honours degree programme and one level 7 degree programme. Level 8 programmes are 4 years in duration while level 7 programmes last for 3 years. Level 8 and 7 software degree programmes are also offered. Please click on the following links for detailed infomation about each programme. 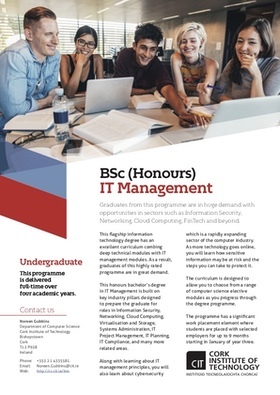 The BSc (Hons) in IT management is the flagship information technology degree programme with an excellent curriculum that combines deep technical and IT management modules. As a result, graduates of this highly rated programme are in great demand. This three year degree programme is delivered over 6 semesters with the final work placement semester based in a company or organisation. This practical degree programme focuses on how IT helps to support the operation and growth of modern organisations. 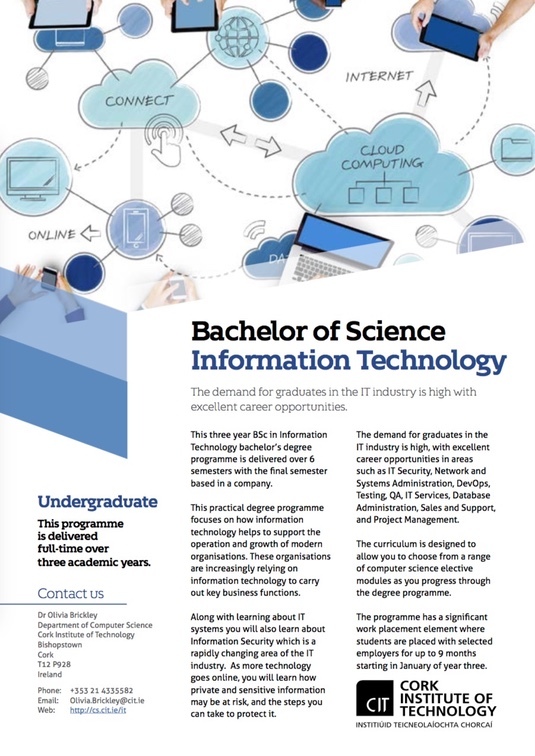 Alternatively, if you just need a quick overview of each Information Technology programme please click on one of the images below to download a pdf flyer for each programme. The flyers offer a brief introduction to each programme and include full programme schedules. The schedules have hyperlinks to every module descriptor allowing you to get to all the information that you need.